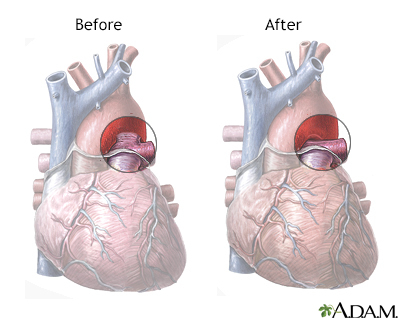 Congenital heart defect corrective surgery fixes or treats a heart defect that a child is born with. 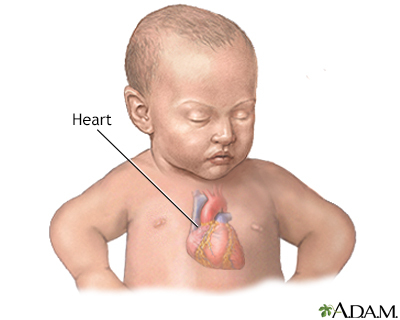 A baby born with one or more heart defects has congenital heart disease. Surgery is needed if the defect could harm the child's long-term health or well-being. There are many types of pediatric heart surgery. Before birth, the baby has a blood vessel that runs between the aorta (the main artery to the body) and the pulmonary artery (the main artery to the lungs), called the ductus arteriosus. This small vessel most often closes shortly after birth when the baby starts to breathe on their own. If it does not close. 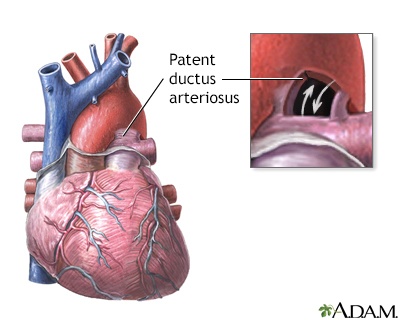 It is called a patent ductus arteriosus. This could cause problems later in life. Sometimes the PDA can be closed with a procedure that does not involve surgery. The procedure is most often done in a laboratory that uses x-rays. In this procedure, the surgeon makes a small cut in the groin. 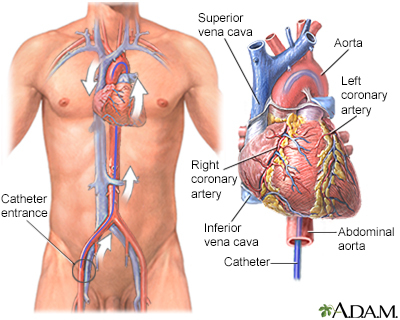 A wire and tube called a catheter is inserted into an artery in the leg and passed it up to the heart. Then, a small metal coil or another device is passed through the catheter into the infant's ductus arteriosus artery. The coil or other device blocks the blood flow, and this corrects the problem. 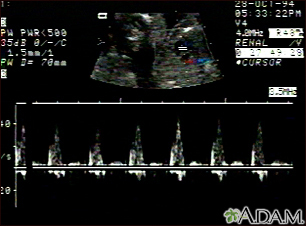 Coarctation of the aorta occurs when a part of the aorta has a very narrow section. The shape looks like an hourglass timer. The narrowing makes it difficult for blood to get through to the lower extremities. Over time, it can lead to problems such as extremely high blood pressure. To repair this defect, a cut is most often made on the left side of the chest, between the ribs. There are several ways to repair coarctation of the aorta. Another way to repair this problem is to remove the narrow section of the aorta and stitch the remaining ends together. This can most often be done in older children. A newer method does not require surgery. A small wire is placed through an artery in the groin and up to the aorta. A small balloon is then opened up in the narrow area. A stent or small tube is left there to help keep the artery open. The procedure is done in a laboratory with x-rays. This procedure is often used when the coarctation reoccurs after it has been fixed. 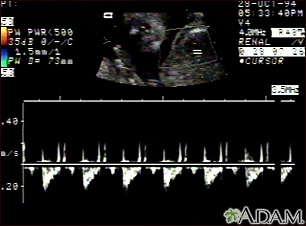 The atrial septum is the wall between the left and right atria (upper chambers) of the heart. A hole in that wall is called an ASD. In the presence of this defect, blood with and without oxygen can be mixed up and over time, cause medical problems and arrhythmias. Open-heart surgery may also be done to repair ASD. In this operation, the septum can be closed using stitches. Another way to cover the hole is with a patch. 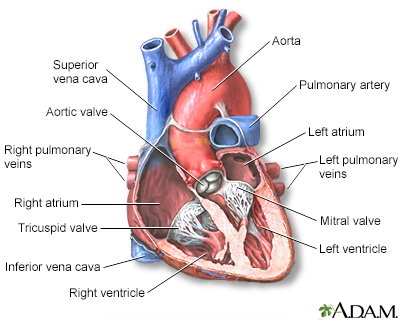 The ventricular septum is the wall between the left and right ventricles (lower chambers) of the heart. A hole in the ventricular septum is called a VSD. This hole lets blood with oxygen mix with used blood returning to the lungs. Over time, irregular heartbeats and other heart problems can happen. By age 1, most small VSDs close on their own. However, those VSDs that do stay open after this age may need to be closed. Larger VSDs, such as small ones in certain parts of the ventricular septum, or ones that cause heart failure or endocarditis, (inflammation) need open-heart surgery. The hole in the septum is most often closed with a patch. 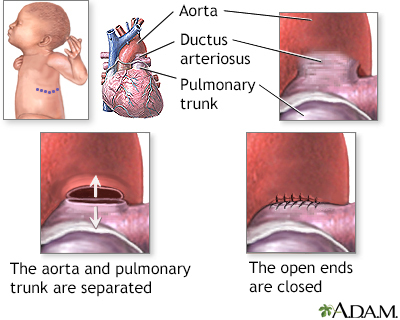 Some septal defects can be closed without surgery. The procedure involves passing a small wire into the heart and placing a small device to close the defect. TAPVR occurs when the pulmonary veins bring oxygen-rich blood from the lungs back to the right side of the heart, instead of the left side of the heart, where it most often goes in healthy people. This condition must be corrected with surgery. The surgery may be done in the newborn period if the infant has severe symptoms. If it is not done right after birth, it is done in the first 6 months of the baby's life. This is a very severe heart defect that is caused by a very poorly developed left heart. If it is not treated, it causes death in most babies who are born with it. Unlike babies with other heart defects, those with hypoplastic left heart do not have any other defects. Operations to treat this defect are done at specialized medical centers. Usually, surgery corrects this defect. A series of three heart operations is most often needed. The first operation is done in the first week of the baby's life. 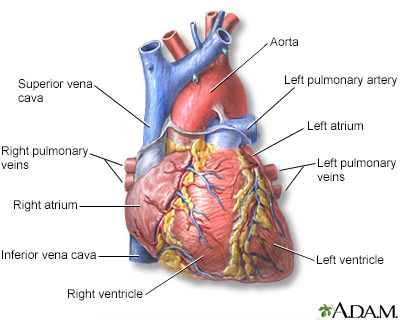 This is a complicated surgery where one blood vessel is created from the pulmonary artery and the aorta. This new vessel carries blood to the lungs and the rest of the body. 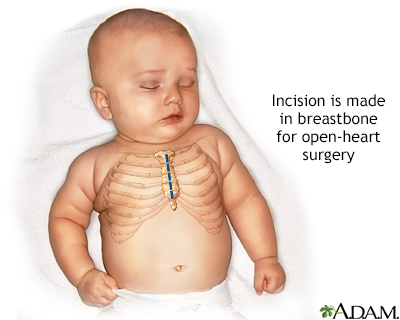 The second operation, called a Fontan operation, is most often done when the baby is 4 to 6 months old. Bhatt AB, Foster E, Kuehl K, et al; American Heart Association Council on Clinical Cardiology. Congenital heart disease in the older adult: a scientific statement from the American Heart Association. Circulation. 2015;131(21):1884-1931. PMID: 25896865 www.ncbi.nlm.nih.gov/pubmed/25896865. LeRoy S, Elixson EM, O'Brien P, et al; American Heart Association Pediatric Nursing Subcommittee of the Council on Cardiovascular Nursing; Council on Cardiovascular Diseases of the Young. Recommendations for preparing children and adolescents for invasive cardiac procedures: a statement from the American Heart Association Pediatric Nursing Subcommittee of the Council on Cardiovascular Nursing in collaboration with the Council on Cardiovascular Diseases of the Young. Circulation. 2003;108(20):2250-2564. PMID: 14623793 www.ncbi.nlm.nih.gov/pubmed/14623793. Reviewed By: Michael A. Chen, MD, PhD, Associate Professor of Medicine, Division of Cardiology, Harborview Medical Center, University of Washington Medical School, Seattle, WA. Internal review and update on 11/06/2018 by David Zieve, MD, MHA, Medical Director, Brenda Conaway, Editorial Director, and the A.D.A.M. Editorial team.